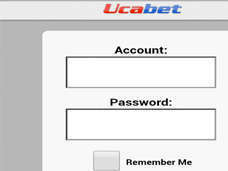 In business since 1995, UcaBet is an elder statesman in the cyber betting world. In a time where internet connections restricted the online betting world, sites such as UcaBet built a client base and a reputation for providing solid customer service and good betting lines.In the time since those days, the online betting market has changed quite a bit. Regulated zones such as Europe are enjoying betting sites that offer live bets, and adjusting odds in experiences that rival what is available on most PCs.Many sites based in Costa Rica have struggled to keep up with this level of innovation in the mobile realm. Is UcaBet one of these such sites? This review will will let you know, as we analyze the mobile site, the betting features, customer service, and banking system. Using a HTC Droid DNA smartphone as our test device, we were running Android 4.1.1 Jellybean with a 5 inch screen, 1.5Ghz Snapdragon Quad Core processor with 2 Gigs of RAM. Needless to say, we were prepared for anything UcaBet threw our way. 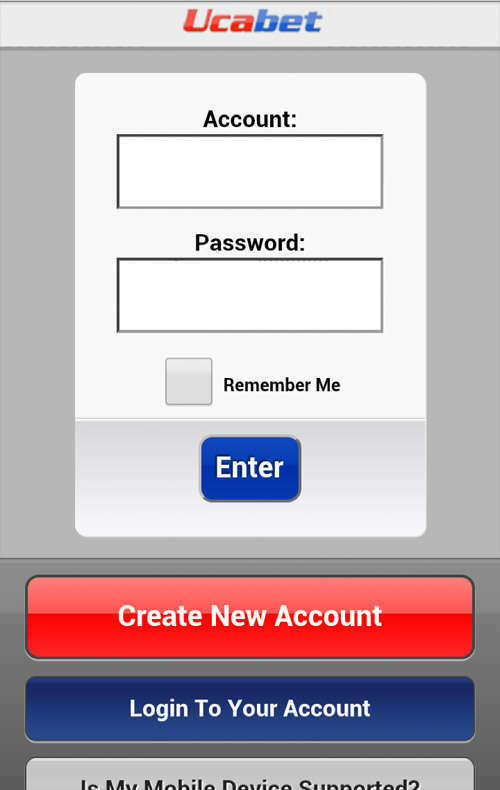 We navigated to UcaBet’s online site using our stock web browser, and we were able to register an account easily. While we could have placed bets through the land based site on our phone, we are here to see what the mobile site can do. We navigated to m.ucabet.co and found that the site appears to be the same as many other Costa Rican based betting sites we have seen out there. While this led us to believe the sportsbetting would be simplified, we were thrilled to see casino games included in the mobile site. This allowed us to see a bit of variety in the site, and we couldn’t wait to play the casino games. But first things first: We need to take a look at UcaBet’s biggest feature… the sportsbetting. Sportsbetting is what UcaBet built its name on, and it is a bit disappointing to see the same limited mobile bets that other sites such as JustBet and BetGuardian offer. 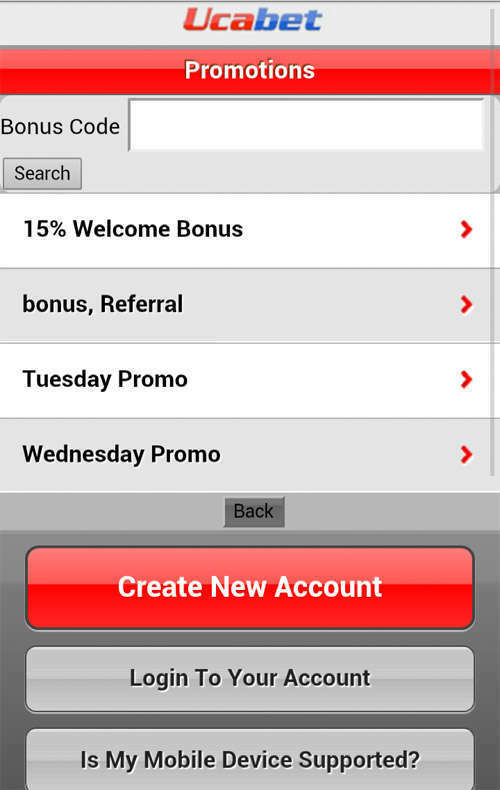 Bets offered at the mobile site include: Straight Bets, Parlay Bets, and Teaser Bets. While this a good start, we will note that Prop Bets are missing, as are live bets that we have seen at rival sites such as Bovada. This appears to be a software issue, but these books should demand better of their provider in order to keep pace with other books. Sports offered for betting was much better, as we saw soccer, football, baseball, basketball, golf, hockey and tennis being offered. We do wish the variety of bets offered was better, but overall we are willing do deal with the smooth looking interface, which is stable and still quite a bit of fun to play at. After we discerned that the sportsbetting experience was more or less the same as many other Costa Rica betting sites, we were more than ready to move on to UcaBet’s mobile casino. Because we weren’t anticipating any casino games, even the limited number of casino games came as a welcome surprise. Within the mobile casino we found three different slots, three video poker games, and five table games. Let us say that these games were a blast. The video slots were surprisingly in depth, with Santa’s Gifts being our favorite game that we played. Table games also impress, with bright colors, big buttons, and easy action. Needless to say, UcaBet hits it out of the park in the casino. This software would be a good example of just what the sportsbetting section should look and feel like, and I hope that someone there reads this review and takes it to heart. 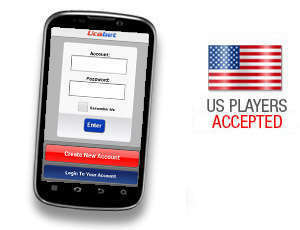 Banking at UcaBet is limited, although this is to be expected as the site solely accepts American action. Visa cards, MoneyGram, and Western Union are listed as the deposit options, while withdrawals are processed as Money Orders and wire transfers. Customer Service is another bright spot for UcaBet, with representatives helping through email, telephone, and instant message. 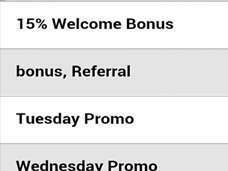 We didn’t have any real issues, but did chat up a rep on instant message regarding a bonus. We found our rep quick to respond, and the bonus was credited within minutes. UcaBet has been in business for 18 years for a reason, and that reason is that they do business the right way. While it may not be the most innovative mobile sportsbetting website, UcaBet takes great strides in offering a touch friendly experience with an excellent casino option. We would like to see the sportsbetting options expanded more, but overall this is a great place to play.